90 lenses per box @ $58.29 per box. Minimum order 2 boxes (three months' supply). 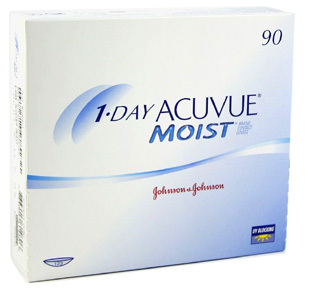 The Acuvue 1 Day Moist is an improved version of the original Acuvue 1 Day lens with the added benefit of Johnson & Johnson's LACREON technology, enabling the lens to retain its moisture for a longer period of time - meaning it feels as fresh when removed at night as it did when inserted in the morning. Each lens also offers UV protection, a light blue handling tint (making it easier to spot if dropped) as well as an inside-out marker to prevent incorrect insertion. The 1 Day Acuvue Moist is our best-selling lens for good reason.